What Are The Healthy Foods To Eat After A Heart Attack? 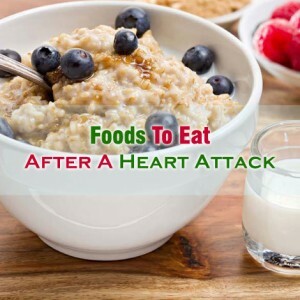 Home > Heart Diseases > What Are The Healthy Foods To Eat After A Heart Attack? There are many people who are able to survive their first heart attack. These people also move on to living a productive and a healthy life. The reason behind this is the fact that these people always make it a point to cope up with their heart issues in a healthy manner. These patients need to be aware of the steps that they have to take in order to live a healthy life. Heart attacks can be life threatening. It is a condition when the heart does not receive blood or the flow of blood to the heart stops suddenly. The surrounding tissues get damaged immediately. Fortunately, there are people who survive a heart attack if they are given immediate treatment. Having an idea about the foods to eat after a heart attack can significantly help in reducing the chances of suffering another attack. Oatmeal is quite rich in its content of soluble fiber and this helps in lowering cholesterol. Oatmeal works in the form of sponge within the digestive tract. It soaks up cholesterol and therefore helps the body in eliminating bad cholesterol in place of absorbing it. Blueberries and almost all types of berries can always be of good help in providing a soothing effect to the heart. Having strawberries and blueberries after a heart attack can considerably decrease an individual’s chances of suffering from an attack all over again. Fatty fish is one of the best foods to eat after a heart attack. Salmon is one good food for heart attack patient. Individuals who have already suffered a heart attack should make it a point to eat minimum two portions of fish every week. This is because fish contains omega-3 fatty acids that help in preventing heart diseases. The best oily fishes for heart health are mackerel, salmon, fresh tuna, trout and sardines. It has been evaluated through studies that good quality dark chocolate can always benefit the heart. People who have had a heart attack before should consume dark chocolate as it reduces the chances of nonfatal stroke and heart attacks. A person who had heart attack, can also eat soy for maintaining healthy heart. Different spy products like soy milk and tofu are one of the best ways of adding protein to an individual’s diet without cholesterol and unhealthy fats.